Although many photographers practice street photography, or would like to start practicing, and even if it increases the interest in this kind every day there is also a considerable number of people in the photographic community who consider rude and offensive to photograph a subject unaware and without permission. Imagine a world of set up portraits, fashion shots but without the candid moment, the only pictures of people would be posing photographs. And the man would no longer be described with sincerity. Photographing strangers without their permission made it possible to create masterpieces of photography. But still it is considered rude not to ask permission to photograph a person in the street. This depends very much on a widespread ignorance that sometimes affected even some photographer. is one of the reasons of so many difficulties encountered by those approaches to street photography, is not uncommon for a photographer who begins to consider take pictures of strangers action almost forbidden to be done in quickly and in secret. And with a sense of guilt doesn’t make great pictures, because the body language not help you. Over the last years we have seen a lock-in to the street photography for the privacy issue but also for the terrorism. These are two important topics which must be analyzed separately. A hot topic that has come inevitably to involve street photography. Ironic from a certain point of view because in public areas there is no privacy. It is ironic because in a town center is full of circuit cameras that filmed continuously.In Europe the situation is particularly acute. To contribute to the climate of suspicion towards the photographers there is internet. People are afraid that its own image can be spread on the web. A legitimate reason especially with children and with the danger pedophilia. But even here the main problem is a lack of culture by persons. On internet many parents pubblish photos of their children or allow that they themselves may open accounts in social networks. Think to facebook. There, the photos can be downloaded by anyone and without control. Yes, there are ways to limit its spread, but not enough. But then they are the first to suspect a photographer in the street. I believe that even the poor culture of photography helps to create false problems. Without falling into the same error but I would say that a photographer with a short focal lens, maybe fixed, does not represent any kind of problem in this sense. Why is forced to come closer to take the photo. Why we see what he’s doing. Wanting to be suspicious, then a photographer with a telezoom that take pictures of people could be more “dangerous”. But we are not here to generate suspicion towards a healthy practice as that of photography. We have already said: It should make a distinction between privacy and the right image because the law requires it. The misinformation, the convenience of someone managed to confuse the ideas of the people. It is our duty as photographers, through the way we take pictures in the street, with an open and positive approach, respectful of the individual, that we can make understand that from photography must have nothing to fear. That it’s nonsense. The 9/11 terrorists didn’t photograph anything. Nor did the London transport bombers, the Madrid subway bombers, or the liquid bombers arrested in 2006. Timothy McVeigh didn’t photograph the Oklahoma City Federal Building. The Unabomber didn’t photograph anything; neither did shoe-bomber Richard Reid. Photographs aren’t being found amongst the papers of Palestinian suicide bombers. The IRA wasn’t known for its photography. Even those manufactured terrorist plots that the US government likes to talk about — the Ft. Dix terrorists, the JFK airport bombers, the Miami 7, the Lackawanna 6 — no photography. This is worth fighting. Search “photographer rights” on Google and download one of the several wallet documents that can help you if you get harassed; I found one for the UK, US, and Australia. Don’t cede your right to photograph in public. Don’t propagate the terrorist photographer story. Remind them that prohibiting photography was something we used to ridicule about the USSR. Eventually sanity will be restored, but it may take a while. The suspicion that these measures taken by some countries after the terrorist attacks are aimed at limiting personal freedom and human rights is very strong. The photography paranoia is therefore a waste of energy and money. In a country like Italy for example is not unusual to see a sign prohibiting photography inside the metro stations. In Los Angeles you can take pictures inside the stations and on the subway with no problems. So what are the real reasons for these restrictions? We always defend as photographers, but first and foremost as human beings the freedom to photograph. Remembering that freedom of the press is an inalienable right to anyone. If we surrender in front of this, if even the photographers make think that cann’t take pictures in the street, we will lose one of human rights. >Well done. Here in Italy privacy issue on using pictures are really restrictive. I said on using not on taking but people are not aware of that. 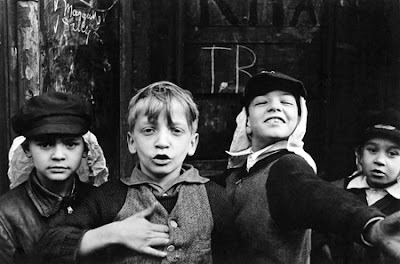 Can you imagine Paris without Doisneau, the world without Frank or Friedlander? >You are right, man! Thanks for sharing your experience.